The US development of a 1,000-mile range "supergun" which it claims to be able to engage the Chinese military in the South China Sea could be a cover for an anti-ship intermediate-range ballistic missile, since such a weapon would break the Intermediate-Range Nuclear Forces Treaty (INF Treaty) which the US is trying to withdraw from, Chinese experts said. The experts' remarks came after the US Army claimed last week to be developing a "supergun" capable of engaging Chinese naval vessels in the South China Sea from 1,000 miles (1,610 kilometers) away. The weapon could "open the door" for the US Navy and Marines in the South China Sea if Chinese naval vessels are in the way, according to US Military Secretary Mark Esper, US media outlet the National Interest reported Friday. "You want to be outside the range that they can hit you," Esper said, boasting of the tremendous range the "supergun" could cover. A Chinese military expert who asked not to be named told the Global Times that cannons have a range of no more than 100 kilometers. Even the electromagnetic railgun the US is developing has a range no more than 300 kilometers. So the 1,000-mile "extended-range cannon artillery" Esper said is most likely a long-range missile, according to the anonymous expert. As technology advances, a long-range missile has little difference with a missile, and a missile capable of reaching 1,000 miles is considered an intermediate-range missile, and thus violates the INF Treaty, the expert said. This is why the US calls the weapon a cannon, the expert told the Global Times. The US is considering withdrawing from the INF Treaty in February, the Guardian reported on January 16. The treaty between the US and Russia bans missiles with a range of 500-5,000 kilometers of the two countries. Even if the weapon is successfully developed, China is not outranged at all, as China has weapons like the DF-26 missile that reportedly has a range of 4,500 kilometers and can reach US naval bases in Guam in the western Pacific, and air strikes with warplanes are also on the table, analysts said. 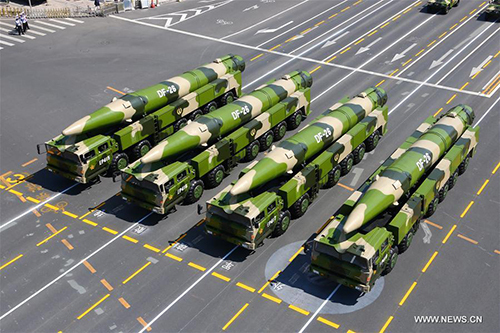 Chinese experts believe the whole "supergun" tag could be a cover for the US to develop a DF-26-like intermediate-range ballistic missile capable of targeting moving vessels while avoiding the INF Treaty. 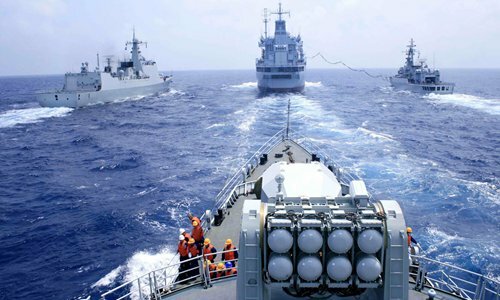 Wei Dongxu, a Beijing-based military analyst, told the Global Times on Monday that such a weapon can pose a serious threat to ships. He expects the US missile to be mounted on a mobile platform on land, which makes it difficult to locate. On another aspect, the South China Sea issue is being used by US Army ground forces to show their strategic value, analysts said.